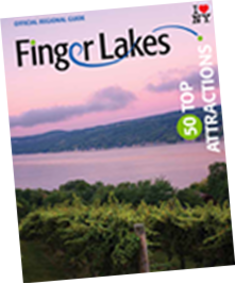 With our rolling hills, sparkling lakes, dramatic gorges and waterfalls, the Finger Lakes is like no place you’ve been (unless you’ve been here before!) Whether you’re planning your first visit, second, or tenth trip with us, we’re thrilled to share our region with you. We were also delighted to share it with Victoria Shepherd as she explored. Watch her adventures below. From magnificent lakes and breathtaking surroundings, to outdoor activities and world-class distilleries, this place will wiggle its way into your heart. Victoria explores the Cayuga Lake Scenic Byway – a place that’s all about outdoor fun and excitement, and plenty of food and wine. Cayuga Lake is the longest of the Finger Lakes and second largest lake. Native Indian folklore tells that the Finger Lakes were created when the High Spirit placed his hand upon the earth as his final act, to bless this area with outstanding natural beauty. Since it’s so gorgeous here, it’s a story that is easy to believe. When people talk about New York, they naturally think of bustling, fashionable New York City. But there is, in fact, an entire state to explore full of vast landscapes and amazing natural scenery. Not far from the city, surrounded by exquisite countryside, is picturesque Syracuse. This prime location offers a refreshing blend of entertainment, history, adventure and culture.